Since moving to the Portland area, I've been having a blast getting to know my new home. And I've been spending a lot of time in eastern Oregon, which has fed a desire to revive an initial layout idea I have of a fictional class 2 running from Washington's Palouse region (Spokane area) through Bend and Klamath Falls to California; basically a fictional reboot of the SP&S and GN Inside Gateway featuring Bend to Klamath Falls on the layout. What I can't seem to work out from that is a decent amount of train traffic other than staging-to-staging run-throughs, because there's not a lot between Bend and KF. Lately though, the prototype bug has been biting and, because the former poses issues of too much scenery expanse between communities, I've been looking at denser locales and become fascinated by the former SP&S dog leg out of Portland heading west and south. And I've been fantasizing about having three worlds in one layout - the desires to have heavy industrial switching, a small port, and bucolic ag communities. The route out of Portland to Eugene heads due west to the Columbia River fishing port of Astoria. Along the way, at Linnton, it ducks into a tunnel and then burns up the Cornelius Pass to Orenco, with a branch to the mill in Kearsey between the two, and another short branch to Forest Grove at Orenco, then doglegs south through the west side of the sometimes swampy but mostly bucolic Willamette River Valley down to Salem, Corvalis, and ultimately Eugene, with mill branches on the south end too. So I'm thinking Portland industrial (with staging to represent the line from Vancouver and points east) and a condensed Astoria Branch on lower level, helix at Linnton to represent Cornelius Pass grade, and a condensed Orenco to Salem portion of the division on the upper level with staging to represent Forest Grove branch, Kearsey branch, and points south past Salem. Plenty of traffic and out-and-back runs, boo-koo scenery diversity and signature scene availability (Astoria canneries, a small car ferry, plenty of grain elevators...) and, if I model early BN, I can have plenty of paint scheme diversity and keep a lot of Alcos around. Modeling a lot closer to home will allow me greater ease in research too. I know I won't be able to come close to accurately representing these places in the early 70s, I will be able to capture the flavor and model some prototype scenes; but a lot has and continues to change in this area, which is one of the fastest developing parts of the country. Any thoughts? Am I waffling too much? Much of that was originally the Oregon Electric, so if you wanted an older era, you could use interurbans and freight motors. If you're serious about modeling the SP&S, you might try to find a copy of "The Northwest's Own Railway", by Walter R. Grande, Grande Press, 1992 (2 volumes). The second volume featured these local branches. I wonder if Powell's Books www.powells.com might have, or know where to find, a copy? I have both volumes. They're packed up in my office, which is the last room on the remodel docket. That may change soon though. I'm going to put some feeler posts out on the PS&S and BN lists too, to get some idea of what industries existed (SP&S list) and what the traffic was like early on the BN for the OE lines. I'm a bit of a lone wolf, which I think is why I want to model the Astoria Branch, for solo running. And the Salem component will allow me to have ops sessions and socialize too. You hid this part in tiny text! I just rode through this area on the Starlight yesterday. Plus spent some time in Salem last year for the eclipse. All I can say is, yeah, I think it's awesome model railroad fodder, and you have a great concept. The amount of rail and and equipment around in Portland is awesome, no worries about that part of the layout being a 'spaghetti bowl' since it would be prototypical! And then a single-track with industries and kindof minimalist scenery on another level. What I like about the concept is that if you have something you want to include, you can probably find a place to include it without having to rethink the layout concept or have it perfectly planned from the start. Thanks, it was so tiny I completely missed that. It does explain a lot too. This sounds great - a lot of the SP&S modeling is concentrated in the Gorge or on the Oregon Trunk so something on the lines south of Portland will be a refreshing change. Better stock up on those RS-3's through! Lots of elevators, mills, and canneries in that period down the valley too especially in the Salem area. I remember early BN here and the freights were quite varied with many roadnames and car types (in contrast with SP branches that had mostly SP cars and few types). You'll need lots of 40' double door boxcars - still remember strings of them on the line to Sweet Home at industries. At least in the valley enough still exists for you to make a good run at industry types. You could model the yard in Albany...the turntable still exists too. Maybe I should employ you as a tour guide some day on a weekend? When I ride the MAX I notice warehouses that have been repurposed and old ROWs now grown over and I wonder what was there, and do a determined trip south to explore what was and is still there. My references to date have been mostly print and internet photo caches. Better stock up on those RS-3's through! I have a bunch if Milwaukee Fs, but I want to keep those, in case I can ever realize my dreamto create the Mod-u-trak version of the Seattle to Portland shared main. "I have both volumes." Then you're off to a good start. I assume you also have Morning Sun Books' "Color Guide"? I assume you also have Morning Sun Books' "Color Guide"? But of course. I think I have six volumes on the SP&S, and I've collected just about every other book on all of the Hill Lines and early BN published in the last 30 years (the new White River Great Northern book is wonderful). I'm a book hog, the only problem is, as I mentioned, they're all packed up still, after a year of having moved. But, while books provide excellent information and train reference photos, they're generally lacking on the industry side, which I believe to be very important. While I seek out the usual accessible archi-historical sources, I find nothing compares to on-site architectural forensics to help me capture the look/feel of structures. And at the same time I'm doing this, I'm acclimating to the materials, construction, and designs of the Pacific NW, since I grew up in the Mid-Atlantic. Maybe...course I haven't pounded around up there on old BN lines a long time since I'm so dedicated to the SP. The issue that you'll have is that since the growth explosion in Washington County has wiped out a lot of the stuff that you could model.The Hoyt St terminal and yards is completely gone - buried under condos. A lot of the interesting street trackage in the past 10 yrs has been paved over. A lot of that "Portland industrial" south of the wye is really the old NP - switched out of Wilbridge or Lake Yards. The SP&S was the poor stepchild (at least until the Milwaukee got trackage rights with the BN merger). Least the Astoria line is pretty much like it was. The line to Vernonia is a bike trail. There are connections between the old SP and BN that didn't exist in the past especially in the Beaverton area.The connector from Helvetia to Orenco no longer exists and everything south of US26 is disappearing under new developments. You were looking at a lot of low warehouses and light manufacturing industries in that area- easy to model as flats. 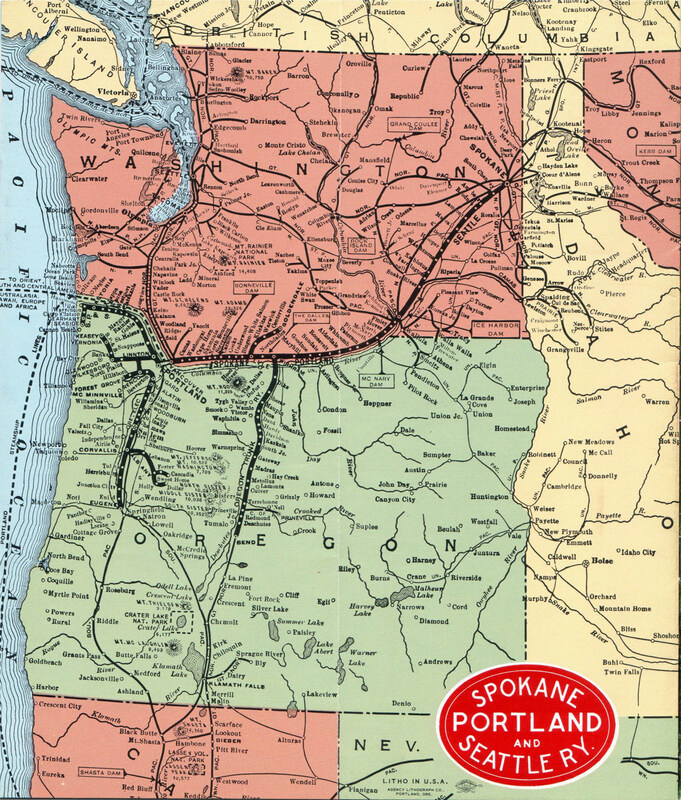 The line between Wilsonville and Salem or Salem-Albany or even Albany-Eugene can be modeled with a assortment of farms, fields, and the occasional siding with a grain elevator and/or feed/seed warehouse. One thing that you will need is a good set of jigs for trestle bents as those lines are full of wood trestles. Your double deck plan could be workable with the Astoria line on the bottom. I'd make everything south of the wye to Vancouver as staging and make it "disappear" with the dense trees that exist there. The Corn Pass line hidden track could start with the tunnel under US30 and pop out on the top deck going over the signature long trestle. You could also have the SP overcrossing at Sherwood and the Willamette River multi-span truss bridge at Wilsonville as signature locations. Throw in some warehouse/industry flats to represent Beaverton/Tigard/Wilsonvile and run down the valley to Salem. You could model the paper mill, canneries, etc there before diving back to staging (there's literally nothing between there and Albany). Other than at Albany (and even there it isn't that large) here really aren't any space-sucking yards - just a few tracks wide in places. "they're generally lacking on the industry side"
Scroll down to Oregon and look at towns along the Oregon Electric, and the Astoria branch. There are 33 industries listed for Astoria alone. Also check the SP&S io group for messages on the Oregon Electric. It's been awhile, but there was a list of OE industries on there, as well as threads about cars seen on the Oregon Trunk, headed to the OE. These included lots of lumber and paper moving, as well as lots of RBLs for the canneries/food processors.